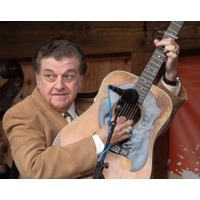 Larry Sparks (born September 15, 1947) is a Bluegrass singer and guitarist. He was the winner of the 2004 and 2005 International Bluegrass Music Association Male Vocalist of the Year Award. 2005, won IBMA for Album of the Year and Recorded Event of the Year for his album "40," celebrating his 40th year in bluegrass music.